h-CD es una proteína reguladora de la contracción celular que se encuentra en el músculo liso y en las células mioepiteliales. Interactúa con la actina, la miosina, la tropomiosina y la calmodulina. Su detección permite identificar tumores de partes blandas con diferenciación de células de músculo liso como leiomiomas, angioleiomiomas, leiomiosarcomas y tumores glómicos. En parénquima mamario se ha demostrado expresión de h-CD en las células mioepiteliales que rodean ductos y lóbulos, siendo negativa en las células epiteliales y los tumores derivados de estas, así como en los miofibroblastos. Es útil junto a otros anticuerpos (SMA, P63,…) en el diagnóstico diferencial entre carcinoma intraductal e infiltrante. Glukhova MA, et al. Developmental changes in expression of contractile and cytoskeletal proteins in humanaortic smooth muscle. J Biol Chem 1990; 265(22):13042. Sobue K and Sellers JR. Caldesmon, a novel regulatory protein in smooth muscle and nonmuscle actomyosin systems. J Biol Chem 1991; 266(19):12115. Frid MG, et al. Phenotypic changes of human smooth muscle cells during development: Late expression of heavy caldesmon and calponin. Dev Biol 1992; 153:185. Lazard D, et al. 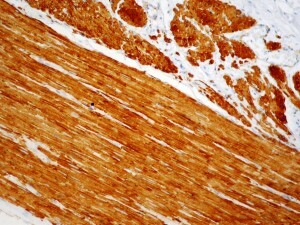 Expression of smooth muscle-specific proteins in myoepithelium and stromal myofibroblasts of normal and malignant human breast tissue. Proc Natl Acad Sci USA 1993; 90:999. Wang NP, et al. Monoclonal antibodies (MAbs) to novel myoepithelium-associated proteins can distinguish between benign and malignant lesions of the breast. US Canad Acad Pathol Abstr 1996; 26A:135. Ceballos KM1, Nielsen GP, Selig MK, O’Connell JX. Is anti-h-caldesmon useful for distinguishing smooth muscle and myofibroblastic tumors? An immunohistochemical study. Am J Clin Pathol. 2000 Nov;114(5):746-53. Watanabe K, Kusakabe T, Hoshi N, Saito A, Suzuki T. h-Caldesmon in leiomyosarcoma and tumors with smooth muscle cell-like differentiation: its specific expression in the smooth muscle cell tumor. Hum Pathol. 1999 Apr;30(4): 392-6. McCluggage WC. A critical appraisal of the value of immunohistochemistry in diagnosis of uterine neoplasms. Adv Anat Pathol. 2004 May; 11(3): 162-71. Miettinen M., Lasota J. Gastrointestinal stromal tumors: review on morphology, molecular pathology, prognosis, differential diagnosis. Arch Pathol Lab Med. 2006 Oct; 130(10): 1466-78. Comin CE. et al. h-Caldesmon, a useful positive marker in the diagnosis of pleural mesothelioma, epitheliod type. Am J Surg Pathol. 2006 Apr; 30(4): 463-9. Comin CE, Saieva C, Messerini L. h-caldesmon, calretinin, estrogen receptor, and Ber-EP4: a useful combination of immunohistochemical markers for differentiating epithelioid peritoneal mesothelioma from serous papillary carcinoma of the ovary. Am J Surg Pathol. 2007 Aug;3198): 1139-48. Ordóñez NG. Value of PAX8, PAX2, claudin-4, and h-caldesmon immunostaining in distinguishing peritoneal epithelioid mesotheliomas from serous carcinomas. Mod Pathol. 2013 Apr;26(4):553-62. doi: 10.1038/modpathol.2012.200. Epub 2012 Nov 30.